2009 - AITHP members at Sera Mey Monastic University, India, receiving, on behalf of Gen Chris Ngawang Yangchen, a certificate of recognition for starting a new approach to Buddhism from H.E. Khensur Rinpoche Ngawang Thekchok, the retired Abbot of Sera Mey. 2008 - H.E. Khejok Tulku Rinpoche opening the current AITHP premises in Chatswood. 2007 - His Eminence Khejok Rinpoche and Gen Chris Ngawang Yangchen during one of Rinpoche’s visits to the Institute. Shortly after, Rinpoche announced that Gen-la had developed a new approach to Tibetan Buddhism. The new approach has evolved from teaching Buddhism within the Institute, when it was originally a Traditional Tibetan Medical Institute. 2007 - Gen Chris Ngawang Yangchen making an offering to His Holiness Khalkha Rinpoche when he visited the Institute. At this time he offered her his support and declared that her teachings were new. In 2008 he became Patron of the Institute in recognition of the Overcoming Problems courses. 2006 - Gen Chris Ngawang Yangchen founded Karuna Cottage part of Shambhala Retreat, in North Queensland. Karuna is run and owned by the North Queensland centre. It is a self-contained cottage on Magnetic Island, available for the physically disabled, ill and elderly to use for convalescence at discounted rates. 2005 - Overcoming Problems courses became part of a therapeutic-yoga-teachers training course that Gen Chris Ngawang Yangchen designed. AITHP trains only a few people, after which they teach yoga by donation within AITHP. Gen-la is recognised as a Senior Yoga Teacher by Yoga Australia. 2001 - Gen Chris Ngawang Yangchen speaking as the Buddhist community representative, at the launch of the Women’s Interfaith Network at Parliament House, Sydney. Gen-la held this office for many years, and at the same time, held office on the Cancer Council NSW Ethics Committee as a minister of religion. 1996 - H.E. Gyalrong Khensur Rinpoche, ex-Abbot of Sera Mey Monastic University on one of his visits to AITHP. In 2008 H.E. 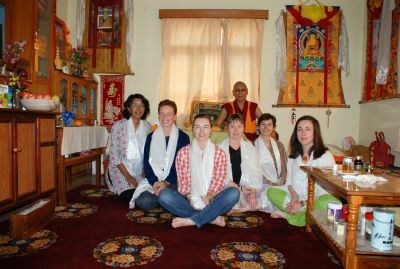 Khensur Rinpoche officially recognised the Overcoming Problems courses as a new approach to Buddhism. In 1998, H.E. Khejok Rinpoche founded another healing centre in Townsville, Queensland, where some of Gen Chris Ngawang Yangchen's Overcoming Problems courses are taught. In 1998, H.E. Khejok Rinpoche dismantled the medical arm of the Institute. At the same time, Rinpoche asked Gen Chris Ngawang Yangchen to keep on teaching and continuing her work. In that same year Gen-la began writing the Overcoming Problems courses. 1994 - 1998 – AITHP moved to a club on the University of Technology Sydney (UTS) campus where Gen Chris Ngawang Yangchen began to research the best way to teach Westerners to change. 1993 - Gen Chris Ngawang Yangchen teaching students walking meditation at Ashfield Uniting Church and Exodus Foundation, where AITHP was located for two years. During this time, Gen-la became more familiar with the western spiritual approach to healing those with problems. The Ashfield Uniting Church and Exodus Foundation are run by Reverend Bill Crews, and feeds the poor and homeless and operates a youth refuge. In 1992 His Holiness Dalai Lama sanctioned the formation of the centre, which was originally the Australian Institute of Tibetan Medical Practices. Later, H.E. Khejok Rinpoche changed the direction of the centre and it's name, to be more in line with Gen Chris Ngawang Yangchen's teachings. In 1992, AITHP was founded by H.E. Khejok Rinpoche when he taught a six-week medical course (pictured above). In that same year, Rinpoche asked Gen Chris Ngawang Yangchen to teach Buddhism in AITHP. In 1993, he prophesied that Gen-la would be teaching people to overcome problems in relation to the mind.